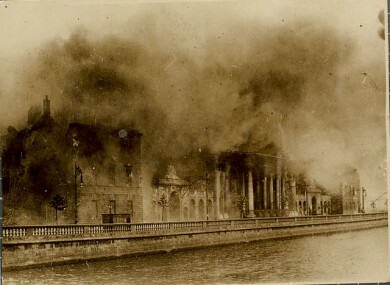 The Four Courts on fire after the devastating explosions in June 1922. THE 30 JUNE, 1922 was a devastating one in the Irish Civil War – and for our national archives. On that day, two massive explosions rocked the Record Office in the Four Courts. The blasts caused a huge fire and destroyed a massive chunk of national records recording the lives and deaths of generations of Irish people. That destruction has made genealogical research difficult, especially from a distance. However, an online archive has been launched of the surviving records which include some materials from Irish census records from 1821-1851 and census search forms from 1841 and 1851. Not only that, the online archive of surviving records is free to access, thanks to a partnership between the National Archives of Ireland, Irish family history site findmypast.ie and also FamilySearch.org. The records contain over 600,000 names from pre-1901 Irish census records. You can also look for them on the genealogy section of the National Archives site here. Of course, the 1901 and 1911 census forms are still fully available online and are an endless source of fascination for family and amateur historians. Email “New pre-1901 online archive to help fill gaps in your family tree”. Feedback on “New pre-1901 online archive to help fill gaps in your family tree”.